Pretty Little Liars - To Plea or Not to Plea - Review: "The Rise and Fall of Hanna Marin"
5.22 - "To Plea or Not to Plea"
Hanna and Caleb contemplate opening the barrel but Hanna can't look thinking Mona's body could be in there. Tanner and Toby bump into them at the storage unit. Mona's lawyer gives Hanna an envelope thirty days after her death. Aria injures her ankle after falling from Mike's exercise equipment and kisses Andrew. Melissa confesses the truth to Spencer via a recording. Spencer arrives in London and meets Colin who is staying at Melissa and Wren's. Mike tells Aria everything with Mona and reveals A had Cyrus get Alison out of town the day Mona was murdered. Hanna and Aria visit Cyrus in hospital who gives them the name Varjack. Aria tells Alison about Mike's confession which could save Alison, but Aria asks for Alison to give her time before she tells her lawyer. In jail, Alison is talking with her lawyer about taking the stand. I can totally understand where the lawyer is coming from because previous lies hinders the credibility of the truth. Very important lesson kids - never tell lies, they just mess things up when you feel like being honest. Alison is about to give Mike up but he won't be able to corroborate her whereabouts when Mona was murdered. The lawyer reveals the DA has made a plea bargain - Alison has to admit she killed Mona and reveal who helped her and she'll only get fifteen years (or ten with good behaviour). Little tangent, I don't think anybody should ever be released early for good behaviour - they're in jail for a reason and they get a pat on the back and early release for being good inside the jail? Unrelated to Alison because I don't want her to get jailed for Mona's murder, but yeah. The lawyer reveals the DA are already building a case against the person they think helped Alison - Hanna Marin! Got to admit, my mouth dropped when she said Hanna's name. Spencer is still in London and Melissa is actually present in this episode. I half expected her to never show up for some reason. Glad to see her. She knows her sister pretty well and Spencer confesses she isn't speaking with Toby, and Melissa gives her sound advice. She really wants Spencer to stay a while longer and tells her it's what she needs - to get away from all the Rosewood drama. Preach. At school, Emily reveals Alison doesn't know anybody named Varjack (see A's Mysteries at the bottom of my review) and they need to speak to Cyrus. After the guy in bandages in the bed near Cyrus creepily stood up, I expected Cyrus to be dead, but Aria reveals he's had a setback and is in the ICU. Emily brings up Mike but Aria shoots her down, but Emily has a good idea of asking if Ezra came across the name in his research. Back in London (this constant country-changing between scenes is giving me whiplash), Colin asks Spencer if she wants to go to the theatre but Spencer has to prep for an interview. She's staying a while longer (boo! I want her back with the girls in Rosewood) and Colin convinces Spencer to accompany him to see a Shakespeare play (Hamlet) by the Royal Shakespeare Company. It's on my bucket list too Spencer. Spencer gets all the nice things. At Hanna's, Veronica has visited Ashley to tell her about the DA investigating Hanna. Hanna overhears everything about her and that bone fragments were in the barrel. 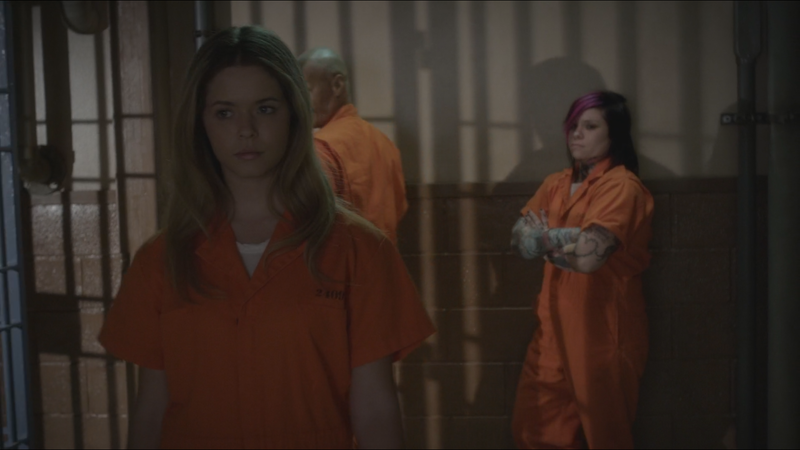 Veronica also reveals Hanna visited Alison in jail twice, much to Ashley's surprise. Poor Ashley. And poor Hanna but Ashley doesn't know a fraction of the story, this must be so hard to hear! At school, Hanna has told Emily and Aria about her predicament. Emily tries to ease Hanna's mind about Alison not taking the plea and naming Hanna as an accomplice. I'm reminded of an Emily of seasons past who trusted Alison explicitally, and here she is trusting her one-hundred percent again. So why do I get the feeling Alison is going to let her down again? Aria was on the phone to Jason who reveals Alison is with her father and they're not taking any more visitors AND she's considering taking the plea. Emily wants to tell Spencer but Aria convinces her to hold off. A note falls out of Aria's locker from Andrew. Emily becomes suspicious of something happening between them since he asks about dinner in the note, and Aria caves and tells Emily they kissed. Emily goes to see Ezra while Aria goes for her test. At Caleb's, Hanna is worried that she might drag Caleb down with her. Caleb convinces her Tanner doesn't have enough evidence on her and Caleb suggests seeing Toby. He's been pretty useless to our main characters, putting duty over friendship, and Hanna knows that. A knock at the door is revealed to be Ashley who tells Hanna she needs to go home with her. Ezra reveals he didn't come across a Varjack. 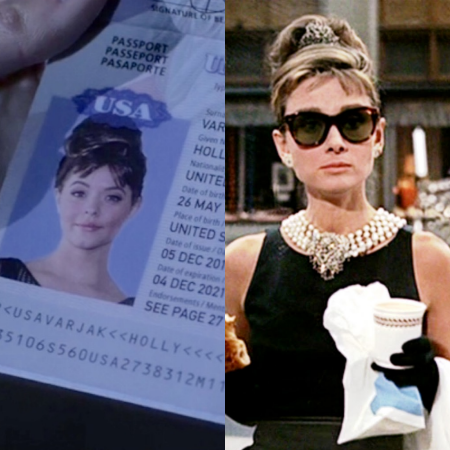 Emily confirms that Alison said the passport was planted that had her name as Varjak, so Alison has no idea. That explains why she said she didn't know the name. Ezra asks who Mona's lawyer was who gave Hanna the envelope after Mona's death and thinks he has something to do with the whole mess. Back with Melissa and Spencer, they have some sisterly bonding time which is pretty nice to see. Too bad I'm too damn suspicious of everything in this show (even blinking - if you blink funny, you're a suspect!) so I can never fully enjoy what appears to be a quiet moment. But damn, I did love Melissa's talk here. "Doing something wrong can seem like the right thing when you're trying to help someone you love. They agree to a fresh start - free of lies. I do hope this works out for them. Ezra is speaking with an attorney about franchising 'The Brew', and it so happens to be Mona's attorney. Ezra begins asking questions which unsettles him and is about to throw him out, but Ezra plays the police card. Aria rushes to Emily who is outside the office of Mona's attorney. Ezra comes out with no news. Neilan appears in a rush and gets in his car, causing the group to be suspicious and follow him. Alison, in jail, sees her room a mess and begins tidying it up before seeing 'Take the Plea' on the wall. Ashley and Hanna return home and Hanna reveals she went to the unit to move the stuff that was in there. Hanna also says the unit was rented in her name the day before Mona's murder. Ashley thinks it's Alison framing her, but Hanna says somebody framed Alison and is now framing her. In London, Spencer buys her first ever beer legally and sits with Colin. She didn't like the Hamlet play performed in a modern-day style. Spencer tries to disguise asking for advice but Colin sees right through it and believes Spencer could start over in London. Hanna is telling Ashley everything in the kitchen. Ashley is the best parent, right? I feel like I could tell her anything too and Hanna probably should have practiced what she preached about honesty episodes ago! Hanna tells her she doesn't know who's doing it to them, but I feel so much better knowing that Ashley knows. Spencer and Colin are playing darts and Colin reveals Melissa has been telling him he and Spencer have things in common. Spencer asks if he bought the tickets that morning and pretended a friend dropped out, but he says "had I known you were a lover of Shakespeare, I would have bought them." Don't know about you guys but British flirting is very blunt and straight-forward. I should know, I live in England, but it's not like I get hit on by cute guys every day. Or any day. Ezra, Aria and Emily have followed Neilan to a very rich estate. Oh my God. Andrew texts at that moment saying 'Congrats on killing the test, beautiful.' I have no idea why Aria had her phone already open on Andrew's message especially since it's apparently the only one he's ever sent her (find that hard to believe) and Ezra looks. There's no time to discuss who Andrew is as they get out the car and Emily runs for the gates before they close. 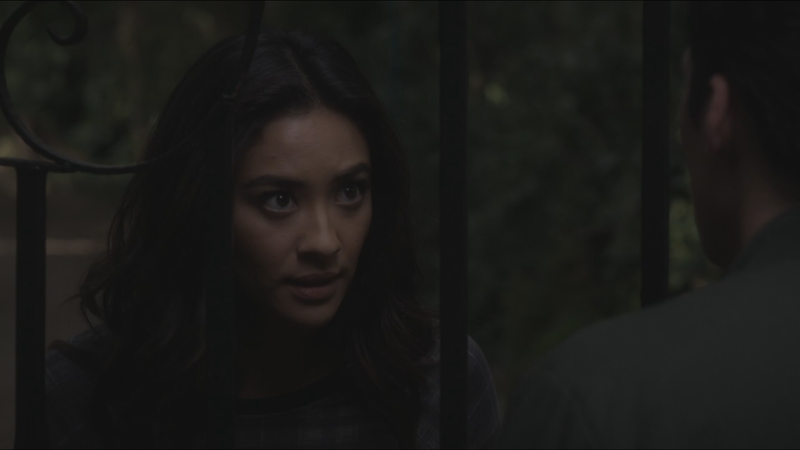 She manages to get inside but Ezra and Aria are trapped outside. They have a look to see if there's another way in while Emily goes to look inside, all the while not knowing there's a camera right there. Surely they should have known there would be since the gates don't roll open by themselves. While Alison is ironing clothes in jail, the other female cellmates throw her major shade. They both leave by different doors before Alison starts hearing noises. We see a shadow and Alison tries to leave but the doors have been locked. She turns and screams. Perfect horror movie material right there. 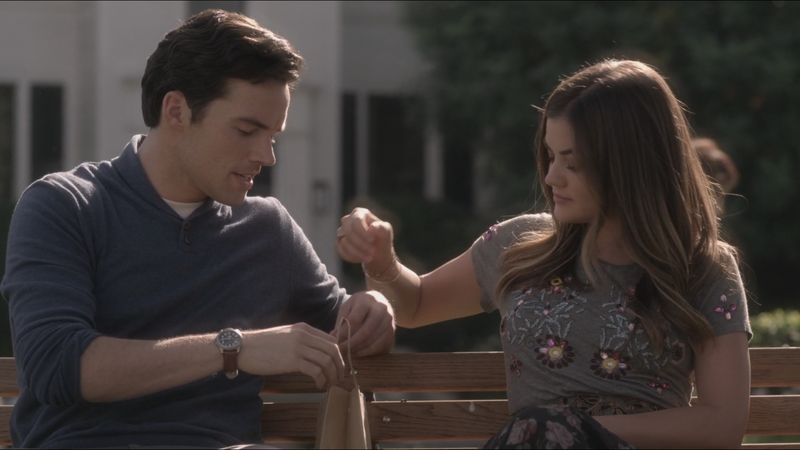 Ezra and Aria discuss things while they look for a way in until Aria suggests splitting up to cover more ground. Ezra gives her a look, and then lingers while looking at the distance when she leaves. He's not happy. Back in the jail, Alison (who appears shaken) phones Rebecca, her attorney, and says she'll agree to what she said earlier as long as they transfer her to a safer place. Looks like somebody is taking that plea. Act IV: Guess Who's Coming to Jail? Spencer and Colin get back to the apartment, drenched, before there's some obvious sexual tension and Colin leans in for the kiss. Yet another kiss with someone who isn't Toby, Spencer! First Jonny, now Colin. Can't say I'm really pleased about that even if they do have lots in common. Back at the jail, Veronica visits Alison and asks about the deal. Veronica is confused about Alison's change of heart from telling the truth but sees an iron burn mark on Alison's arm. Veronica tries to reason with Alison and worries for Hanna. Back at the fancy home, Emily is going through the trash and finds a receipt with Varjak's name on it from a pizza place. She hears a bang and scarpers away. Caleb knocks on Hanna's kitchen door and she answers. Toby wouldn't tell Caleb the evidence they have on her (of course not) but he does reveal the judge has issued a warrant for her arrest. Hanna panicks and wants to go somewhere else but Caleb wants her to tell Tanner about A. Hanna doesn't want to, because A) A will retaliate and B) it affects the other girls too. Especially Aria since she would have to tell Tanner about New York and Hanna doesn't want to screw the girls over. But Caleb doesn't see a choice. I loved this scene, the music, everything was so frantic. I was feeling really scared for Hanna too. At the house, Emily sees Nielan inside putting things in a bag. Emily knocks something over, causing him to pick up his gun and go to the window but Emily hides. 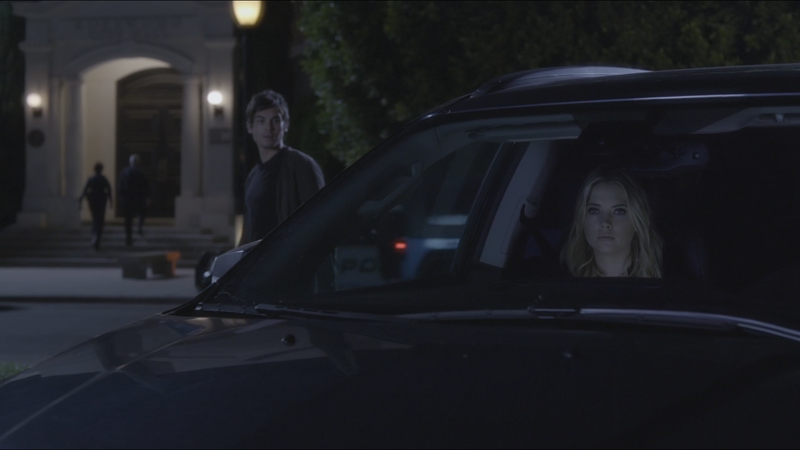 Caleb drives Hanna to the police station. Hanna is at first reluctant to go but Caleb helps her and says she'll be fine with all of A's messages on her phone. Inside, Hanna speaks with an officer about being framed and he asks for her name. He leaves and while he does, Hanna checks her phone. The messages from A begin to be deleted as someone has hacked her phone, wiping all evidence from it. The officer comes back and says Tanner will see just Hanna. Back at the house, Aria and Ezra didn't find a way in so Aria begins to ring Emily. Nielan gets into his car when Emily's phone vibrates. Nielan hears and goes to investigate. We see from outside with Aria and Ezra that Nielan leaves, followed by Emily. Emily reveals it was Varjak's house and Nielan is working for him. Aria gets a message saying Hanna has been arrested. At the station, Hanna is having her fingerprints taken and photographs and she looks fantastic getting her mugshots taken. Bless her, but she still makes a good photo. The girls have arrived at the station along with Ezra and Caleb wants them to show the texts to Tanner but A has wiped their messages clean too. Emily shows the receipt from the pizza place that also has Varjak's number on it. Veronica talks to Ashley about Hanna's bail but it might not be possible. Veronica reveals Alison hasn't taken the plea yet, Hanna was arrested because blood was found on a shirt Mona was wearing when she died. Spencer is ready to leave when Melissa wakes up. Spencer tells her Hanna was arrested and she has to be there to support her. Melissa reveals that there is no interview for St. Andrew's and that she and Wren have been trying to get her something set up. Veronica heard about the plea bargain and worried Spencer would be named, which was why Spencer was flown to London. Spencer's cab arrives and she leaves while Melissa tells her she tried to help and protect her. At the Brew, Emily phones Varjak's number but we don't get to see who (or if anyone) picks up. 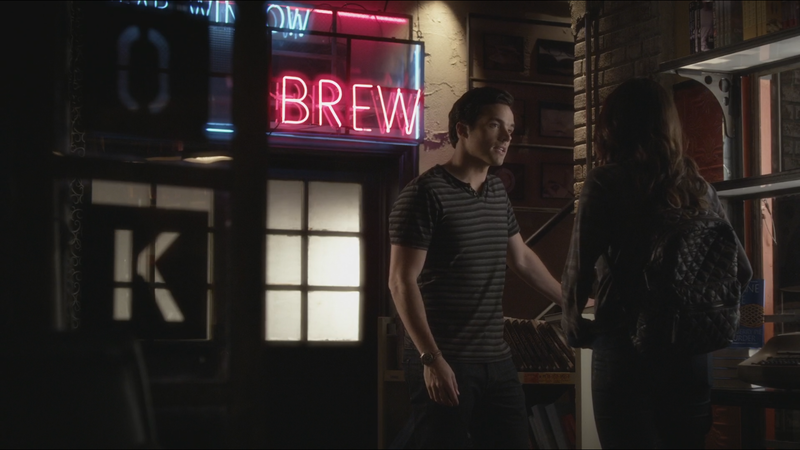 Ezra and Aria meet outside and discuss Hanna briefly. Aria begins to discuss avoiding Ezra, being truthful and saying Ezra was right about missing things in high school. She has no regrets but thinks she should be single when going into college. Ezra agrees and says they should end it there and then. They can't imagine life without each other but they'll figure something out. Pretty sweet really even though I've really been preferring Aria by herself the past few episodes, Ezra-free. Anyway, I'm pretty positive they'll end up back together by series' end. Nothing is keeping these two love birds apart forever. In the jail, Alison hears the doors open and some cellmates welcoming someone, including whistling and cat-calling. Alison goes to the bars on her cell to see who it is, and Hanna turns the corner in her orange suit. 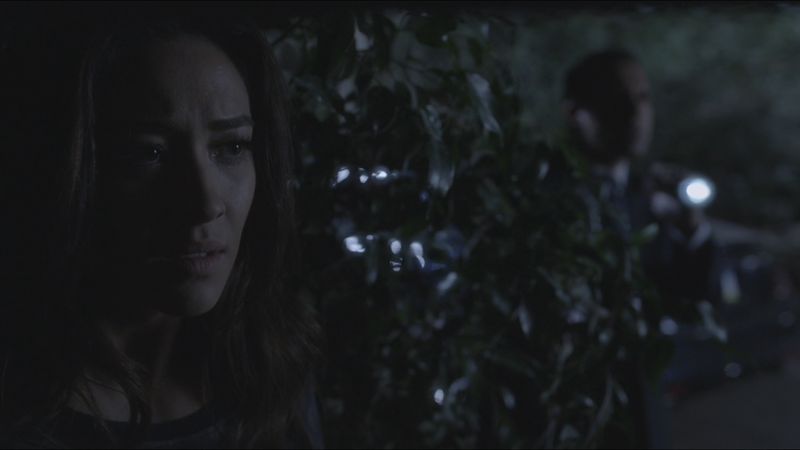 She looks devastated as she walks closer to Alison before looking at her. She mustn't know about the blood on Mona's shirt is what got her arrested, not Alison's plea deal. Alison does look pretty sorry for Hanna. Rebecca tells Alison that the DA will let Alison serve her sentence in a minimum-security prison in Pennyslvania. Rebecca gives her the contract to sign but Alison says she has changed her mind. She isn't taking the plea. Loved, loved, loved Hanna's storyline in this episode. If it wasn't for Hanna, this episode wouldn't have been as great as it was. I really enjoyed this episode. 5B has been pretty hit and miss so far but lately it's really, really heating up. Finally we are getting more in one episode instead of little glimmers of progression here and there. 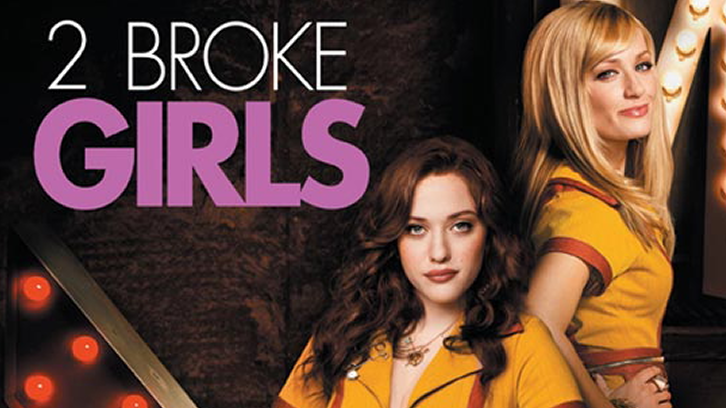 This episode proved it was no filler by having Varjak's house and phone number revealed, showing the girls are on the right track, and had Hanna arrested. The scenes with Hanna were just filled with excitement and revelations at the possibility of the truth being revealed. Unfortunately, A is one step ahead as always which leads to Hanna's downfall. I loved that she confided in Ashley about it (though she probably wouldn't have if Veronica didn't tell Ashley about it first), but it shows Ashley is definitely going to be there for her daughter. Spencer has been boring me lately. Compared to the other girls right now, I really don't care about her college crap. Or Colin crap, I hope that's the last of him. 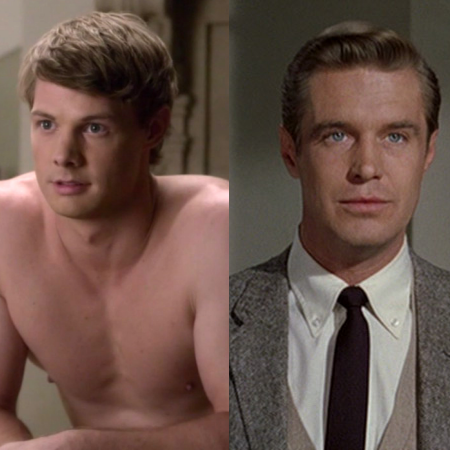 I am pretty sure Spencer has beat the other girls at how many boys they've kissed in the span of the show. She's really cycling through them since Toby like they're on a rota. I wonder who they're going to introduce next just to be a temporary love interest for her. I loved that Melissa was back and she was on fire tonight. She just kept rolling out the good advice and wisdom. Every single time she spoke I couldn't help but raise my arms up and say "preach". They agree to a fresh start, which is a positive sign, and the Hastings sisters are finally on the same page. Emily's storyline involved Aria and Ezra too, though Emily managed to make it through the gate solo so she had to rely on herself to crack the Varjak case, and she just might now she has Varjak's number. I loved her being all detective outside the house and her mini-horror movie scenes with Nielan. Talia wasn't exactly missed in this episode though I do wonder where we will go next with her. Alison was also a joy in this episode as we start to think maybe she will take the plea and bring Hanna down with her, but A already had that covered. As for Aria and Ezra, I'm glad they've called it quits officially. Now they can both sort of move on and do their own thing while always knowing they'll still be there for each other. Aria didn't reveal to Ezra the kiss she had with Andrew, so I guess it really wasn't a big deal for Aria, but I still expected her to be honest about that. All in all, a great, suspenceful episode as Hanna plunges deeper into the hands of A's sadistic plan. Being arrested does not reflect well on Hanna and it makes us wonder how she and Alison are going to get out of this one, and if any of the other girls are going to follow in their footsteps. Man, things are really heating up and getting really dangerous for these girls - I'm excited again! Prettiest Little Liar: Hanna Marin. The Queen of PLL had the best storyline in this episode as she frantically tries to escape the jaws of legal (in)justice. Most Macho Male: Caleb Rivers. He helped Hanna so much and we can always depend on Caleb to be the best outside help the girls have, or ever will have. Favourite Episode Pairing: Hanna and Ashley. I love their mother-daughter relationship and we can see just how scared both are by the events that happen in this episode. Best Line: "And if they don't, I'll be screwing them just like Alison screwed me." - Hanna Marin. Really shows the urgency of the situation, the predicament she is in. Is it going to be every liar for herself? Best Moment: Caleb tells Hanna that the judge has issued a warrant for her arrest. The entire scene was frantic and dire, the music really emphasised the hopelessness of Hanna's situation. Tell the truth and A will retaliate while screwing the girls over. But Hanna can't just do nothing, right? Saddest Moment: Veronica tells Ashley about the blood on Mona's shirt. You can see her heart break as she sees just how bad a situation Hanna is in. Creepiest Moment: A shadow enters the laundry room where Alison is ironing, leading to her trying to escape but the doors are locked. Not the creepiest scene ever but the creepiest in this episode. Biggest Question Mark Award: Who the hell is inside the jail tormenting Alison (the iron burn, the 'take the plea' on the wall) because some of the other inmates are in on it, like the two women who locked Alison in the room. The tormentor must be working for A, right? Biggest Reveal: There's a warrant out for Hanna's arrest. Best Cat Fight: Spencer Hastings vs. Melissa Hastings. We started with two sisters growing closer until the truth wins out and boom, they're apart again. We have a Breakfast at Tiffany's theme going on here. On the left, Alison's 'Varjak' Passport photo. She looks pretty similar to Audrey Hepburn from Breakfast at Tiffany's. On the left is Andrew. On the right is Varjak from Breakfast at Tiffany's. They look pretty similar, right? Maybe Cyrus is a fan of the film and his brush with Andrew outside the pub makes us think they know each other. There's something fishy going on there, right? And isn't Andrew's family supposed to be rich too? Pretty fancy house for just anybody! What did you guys think of 'To Plea or Not to Plea'? Let me know in the comments and be sure to watch the next new episode of Pretty Little Liars on March 10th on ABC Family!